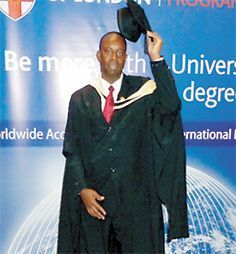 Congratulations to Mr Harold Carlos Lewis of Frenches for successfully graduating from the prestigious University of London on 19th March 2013, with a Masterâs degree in Finance (Majoring in Economic Policy) with honours (Merit). Indeed, you have made your family proud. Continue to trust in the Lord and remain humble. We sincerely wish you Godâs speed in your future endeavours.